Little is known about Thomas Brooks as a man, other than can be ascertained from his many writings. Born, probably of well-to-do parents, in 1608, Brooks entered Emmanuel College, Cambridge, in 1625. He was licensed as a preacher of the gospel by 1640 at the latest. Before that date he seems to have spent a number of years at sea, probably as a chaplain with the fleet. After the Civil War, Brooks became minister at Thomas Apostle's, London, and was sufficiently renowned to be chosen as preacher before the House of Commons on 26 December, 1648. Three or four years later he moved to St Margaret's, Fish-street Hill, London, but encountered considerable opposition as he refused baptism and the Lord s Supper to those clearly unworthy of such privileges. The following years were filled with written as well as spoken ministry. In 1662 he fell victim to the notorious Act of Uniformity, but he appears to have remained in his parish and to have preached the Word as opportunity offered. Treatises continued to flow from his agile pen. In 1677 or 1678 he married for the second time, 'she spring-young, he winter-old'. Two years later he went home to his Lord. Thomas Brooks' "Works" is a wonderful set of books that are solid, sturdy, and edited well. Though the print is somewhat small, the outlines and italics make it easy to read and follow Brooks' discussions and divisions. 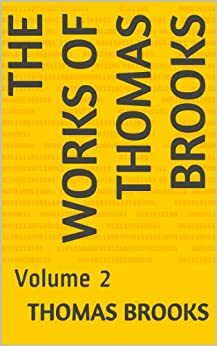 What is more, the contents of Brooks' "Works" are biblical, level-headed, well-rounded, and applicable. Brooks was a Puritan who stood right in line with Reformation theology - specifically that of the Westminster Confession and Catechisms. Brooks knew about sin, he knew salvation in Christ, and he knew what it means to obediently serve the Lord. These books contain wonderful Christian exposition of many aspects of theology and the Christian walk. Brooks does go deep into the Scriptures and the Christian life, but that's part of the reason why he is so good: he doesn't merely scratch the surface like so many Christian authors do today. This is mature Christian theology which will help Christians mature in the faith. There isn't one line of "fluff" in Brooks. The reader may be a bit apprehensive about this set since it is somewhat costly (though sometimes you can find a used set for well under one hundred dollars) and since it is quite long (five thick volumes). If you're considering this purchase, here's my recommendation: First, read one of Brooks' books (like "Precious Remedies" or "Apples of Gold" or "The Mute Christian"). These can be found on Kindle for around one dollar. Second, after reading something by Brooks (assuming you want to read more) get the set and develop a plan for reading. Since the set contains many different books Brooks' wrote, you might just want to read one every few months. Be realistic: perhaps you can read the equivalence of one volume a year; maybe two if you're ambitious. Just stick with it, and consider this set an investment for the years to come. Since it's not a trendy or faddish Christian work, it will benefit you now and as you grow older in Christ. Thomas Brooks is one of the top five Puritans named Thomas. The content is obviously fantastic. This version includes Precious Remedies. This Kindle edition of Brooks' works is terrific. It is easily navigable, and Brooks' main points in his sermons/writings are in bold. Everything is easily accessible from the table of contents. I also haven't come across any grammatical errors either. Buy it and let Brooks' lulling and loving logic grasp your imagination for the glory of God. 5.0 out of 5 starsOne of the best ever of the Puritan preachers of Jesus Christ. I read all but part of volumes 5 & 6 of Thomas Brooks' Works...the Banner of Truth edition is the only one I know of that has the best type, clear, excellent paper and worth every cent. This 6 vol set reads to me just as if I am reading Spurgeon or Martyn Lloyd-Jones, they too had this solid and sound preaching of the gospel of Christ and yet a warmth that comes across and kept me in those pages. Brooks major works are in here too of "Precious Remedies Against Satan's Devices," all the other ones that he wrote and I cannot put down here...look up the table of contents and you will see this is the Brooks best thing to buy first....for ANY sound and solid preaching of current saints now or the great Puritans of before, you will never go wrong if you go to Banner of Truth publishers, in U.S and U.K.
What Iain Murray and Dr Lloyd-Jones worked on with the Banner when things were dark and shadowy in the religious world in the 50's and 60's has since then grown and is responsible, by the grace of God, to produce all that many take for granted now when we see the great works of the Reformed men as Alistair Begg, Al Martin, Iain Murray and the vast works of Lloyd-Jones and Spurgeon...many more too just as these. Brooks is only one of the shining lights available to us this day. Go to Thomas Manton, John Calvin's beautiful "Sermons on Ephesians," "1 Samuel," "Genesis"...precious stuff, thank the Lord for it! I like Calvin's sermons a bit more than his commentaries...both fine but sermons more readable and warm for me.